The NYC Civic Innovation Lab & Fellows Program is empowering NYC’s Community Boards to develop digital and open data practices that are appropriate for the local constituencies they serve. 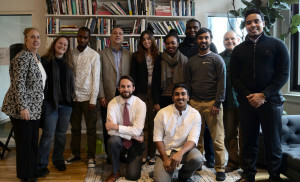 The Civic Innovation Lab (CIL) and Civic Innovation Fellowship (CIF) is the first and only comprehensive program dedicated to improving community boards’ use of data and technology while training the next generation of civic leaders from CUNY. 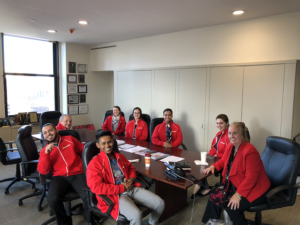 Incubated out of the Manhattan Borough President’s Office, with support from the Mayor’s Office of Data Analytics & CUNY Service Corps, CIL employs three technological researchers and a small class of qualified CUNY Service Corps students, aka CIF. For a period of seven months, CUNY Service Corp Fellows, selected for competency in a variety of relevant skills, are trained in the fundamentals of civic technology, data, and design. After this boot camp training, graduates are partnered into innovation teams who explore projects with Manhattan’s twelve Community Boards. At the same time, staff continuously investigates community board workflows, develops and deploys digital and data literacy trainings, and creates tools for boards and borough president liaisons. This program is a partnership between the Manhattan Borough President Gale A. Brewer, BetaNYC, CUNY Service Corps, and Fund for the City of New York. The program is supported by Alfred P. Sloan Foundation, Data & Society Research Foundation, the Mayor’s Office of Data Analytics, and New York City’s Department of Information Technology and Telecommunications. As of Spring 2019, our program has trained and employed 50 CUNY undergraduates, seven have been selected for mentorship positions and were employed for two years, and over 1,000 New Yorkers have been trained using this curriculum’s core classes. “I have long been committed to open access to government data. As a City Council member, I was proud to sponsor NYC’s Open Data Law, which unlocked a treasure trove of data about our streets, crime, restaurant inspections, and other information gathered by city agencies.But that law was only the first step, as “open” data doesn’t automatically mean “useful” data. “That’s why I am welcoming student members of the CUNY Service Corps to my office. These members will help both our office and our Community Boards navigate City data so that New Yorkers can use the data in meaningful ways. 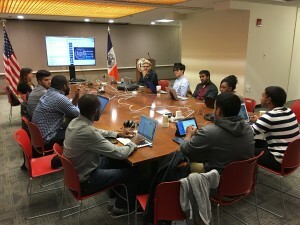 “When BetaNYC was invited to run the Civic Innovation Fellowship program, it was a true honor to participate in Manhattan Borough President Gale Brewer’s vision of increasing the usefulness of open data. We enjoyed the past four years of working with the Borough President’s Office, Manhattan community boards, and the CUNY Service Corps. We look forward to four more years of partnership. Our program has created NYC’s first open data training program. We co-created BoardStat, an open data dashboard for community boards built by community boards, and have outlined a number of strategies to help bring modern, agile tools to community boards. BoardStat was designed with community boards for community boards. BoardStat is a highly interactive tool for community boards that empowers users to discover issues and trends within their district’s boundaries. SLA Mapper (SLAM) – is a tool that aggregates data that community boards often have to gather in order to review liquor license applications and sidewalk cafe applications. BoardTrack – is a community board attendance tracking tool and data standard that helps community board staff submit attendance records to the Manhattan Borough President’s community board liaisons. In turn, liaisons can quickly analyze attendance history. CBDB – a simple database for community boards to track their constituent engagements. 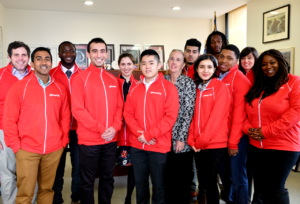 CIF Y4 Cuny Service Corps Civic Innovation Fellows with Borough President Gale Brewer and BetaNYC directors Noel Hidalgo and Emily Goldman, 2017. * YEAR 2 students brought back as mentors. 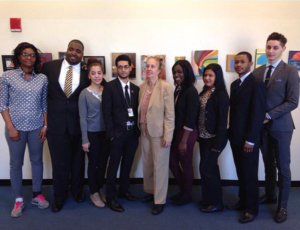 CIF Y2 Students at Data and Society Research Institute with Borough President Gale Brewer, Deputy Borough President Aldrin Bonilla, danah boyd, Ph.D., and Noel Hidalgo, 2015. Community Boards are New York City’s local, volunteer representative bodies. Established by the 1963 City Charter, they oversee land use issues, budget recommendations, and local service delivery. Though this project, BetaNYC and Data & Society, in partnership with Manhattan Borough President Gale A. Brewer (MBPO) and CUNY Service Corps (CUNY-SC), seek to empower Community Boards in the rapidly changing digital environment. MBPO recognizes the unique potential for data and technology to improve the way that municipal government interacts with its constituents. Human centered design principles and updated tools will extend the relevance of Community Boards in a political environment where a variety of stakeholders, such as real estate developers, are already digitally empowered. This project attempts to level the playing field to enable better decision making. In 2014, the Manhattan Borough President’s Office (MBPO) brought in CUNY Service Corp Fellows to expose Community Boards to open data practices. This first, successful iteration of the program lasted six months. While students learned about Community Boards, Community Boards learned they wanted to know more. When the MBPO reviewed the program, it recognized the need for assistance in curriculum development as well as for a partner in managing the program. In the fall of 2014, Noel Hidalgo came to a similar conclusion: New York City’s relationship to open data would be improved by a concerted effort to expand the knowledge and availability of open data practices to as wide a variety of community based organizations as possible. Towards this end, Hidalgo has been collaborating with Pratt University to develop a six-hour long workshop to demystify the process of map making and the flow of data from NYC’s open data portal. This project combines the competencies and resources of MBPO, BetaNYC, and Fund for the City of New York, in an effort to demonstrate the potential for digitally driven communities at the hyperlocal level. 2015 Fellows learning media theory and service design. Build and execute a community development curriculum that integrates civic design, technology, data, and leadership. The curriculum provides a foundation for community members to use their technical skills to support community boards and develop personal leadership, engage in the civic technology ecosystem, and hone digital skills. Someone who is comfortable with a computer, digitally literate with Google docs or Microsoft Office, has access to high speed internet, and a desire to address problems with technology, data, or design. We are testing multifaceted assumptions that cut across government operations, public civic engagement, and open data education. It is possible to build a technology, design, and data curriculum that improves community engagement. There are shared digital inclusion practices that can be replicated across community boards. Municipal data education can be broken down into bite sized chunks. We can successfully deliver a simplified civic technology education to a broad age group. CUNY-SC are primarily lower economic status students who are the City’s future civil service employees and we believe they will carry these skills forward through their careers (longitudinal study needed to assess this). Using a lean model, college level technologists, with the assistance of full-time professionals, can improve Manhattan Community Boards’ information flows. Once trained, Community Board Members and Managers can support each other’s data needs. Creating safe spaces for all. Understanding existing governmental structures and processes. Digital communication skills and traditional media engagement. Designing with multiple perspectives and with underserved communities. Understanding Data and making Government data work for communities. We have broken down content into something easily understandable for anyone new to digital civic literacy, open source, civic hacking, and mobile development. The following is what an ideal multi-year curriculum would look like. Roots, values, and the future. What is open data and open government? An introduction to open source licensing, copyleft, creative commons, and copyright. What is Civic and Service Design? How to use Slack, IRC (Internet Relay Chat) & other group chatting tools.